The CFP multisource agreement (MSA) was formally launched at OFC/NFOEC 2009 in March by founding members Finisar, Opnext, and Sumitomo/ExceLight (now known as Sumitomo Electric Device Innovations USA following the recent merger of ExceLight and Eudyna Devices USA Inc. ). The founding members actually began meeting when the IEEE 802.3 Higher Speed Study Group (HSSG) was only focused on developing a standard for 100GbE. When that activity was expanded to include 40GbE in July 2007, the CFP MSA followed suit. “At the time, we decided to design the CFP such that it could be agnostic and used for both data rates,” recalls Matt Traverso, senior manager of technical marketing at Opnext and editor of the CFP MSA Draft 1.0. The CFP form factor, as detailed in the MSA, supports both single mode and multimode fiber and a variety of data rates, protocols, and link lengths, including all the physical media-dependent (PMD) interfaces encompassed in the IEEE 802.3ba Task Force, which is expected to ratify its standard in 2010. At 40GbE, target optical interfaces include the 40GBase-SR4 for 100 m and the 40GBase-LR4 for 10 km. There are three PMDs for 100 GbE: 100GBase-SR10 for 100 m, 100GBase-LR4 for 10 km, and 100GBase-ER4 for 40 km. There are several design features that enable the CFP transceiver to support this range of distances as well as various power dissipations. 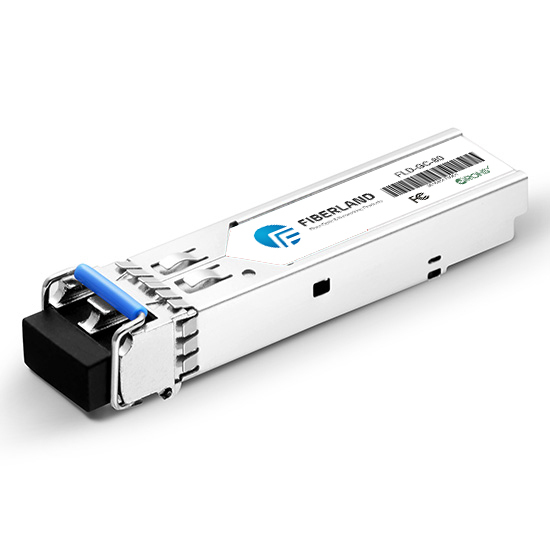 First, its size is optimized for longer-reach interfaces and single-mode fiber applications; it is 120 mm long and 86 mm wide, which is the same length but twice the width of a 10GbE XENPAK. Second, the form factor includes a two-piece electrical connector. The connector itself features two rows—top and bottom—of metal contacts, enabling improved density in its overall footprint. Finally, the CFP also features a new concept known as the riding heat sink, in which the heat sink is attached to rails on the host card and “rides” on top of the CFP, which is flat topped. The heat sink can be included or omitted depending on the thermal requirements of the host system. When included, the heat sink presses down on the module, providing a good conductive surface that is also low friction, says Traverso, making it very easy for the operator to insert the module into the host board. The riding heat sink configuration “allows you to have one opening or aperture on the faceplate that’s the same for all CFPs but also allows the system vendor to decide, ‘Okay, this particular box is great in a low airflow environment, so I really need high heat fans,’” Traverso explains. “Or, ‘I’m only going to accept modules that are 16 W and below; therefore, I don’t need a heat sink because I have good airflow.’ [The riding heat sink] makes the form factor a little bit more flexible for a lot of customers,” he contends. Traverso says Opnext has just begun sampling its CFP transceivers and expects to go into production early next year to coincide with the completion of the IEEE 802.3ba standard. The company displayed its 100GBase-LR4-compliant CFP device at OFC/NFOEC in March. Sumitomo Electric Device Innovations USA, meanwhile, is “focusing on the single mode solution [and] developing the CFP transceiver because we have a very good solution for the 40G and 100G optical light source and receiver,” says Hiro Iwadate, vice president of engineering. He confirms that Sumitomo is already sampling its 40G CFP transceiver, which will be available this year, while the 100G version should be available at the beginning of 2010. Other companies currently developing CFP modules include Avago Technologies , which is now a member of the CFP MSA, and Santur Corp., which is not a member of the MSA but demonstrated a 100-Gbps transceiver platform running over 40 km of single-mode fiber at OFC/NFOEC 2009.